1 of 6 Heat oven to 350 degrees F. Coat a 13 x 9 x 2-inch baking pan with nonstick cooking spray. 2 of 6 Place dates and 1-1/4 cups water in a large bowl and loosely cover with plastic wrap. Microwave on HIGH for 4 minutes. Let cool slightly; transfer to blender or food processor and blend until smooth. Set aside. 3 of 6 In a large bowl, combine cake mix, yogurt, oil and eggs. Beat on medium-high speed for 2 minutes. Add date puree; beat to combine. Pour into prepared pan. 4 of 6 Bake at 350 degrees F for 37 minutes or until toothpick inserted in center comes out clean. Remove to rack; cool. 5 of 6 While cake is baking, stir together the caramel sauce and heavy cream. 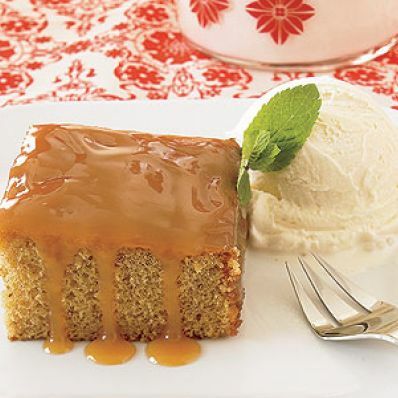 Pour 1 cup caramel mixture over baked cake, spreading to edges as it cools in the pan. Cool cake 20 minutes. Pour remaining sauce back into squeeze bottle. 6 of 6 For each serving, drizzle caramel sauce on a plate. Place slice of cake on plate with a scoop of ice cream. Garnish with mint, if desired.